When you previewed the sample finished file in your browser at the beginning of this lesson, you saw images that appeared at the left side of the button bar when you moved the mouse over those buttons. These are also examples of secondary rollovers for the Over state, but this time the change in appearance is caused by tying the visibility of different layers to the OverStates of the slices. 1 Using the slice select tool (5F), select the Designs_button slice in the image window. 2 In the Rollover palette, click the Creates Rollover State button (j) to create an Over State for the Designs_button slice. 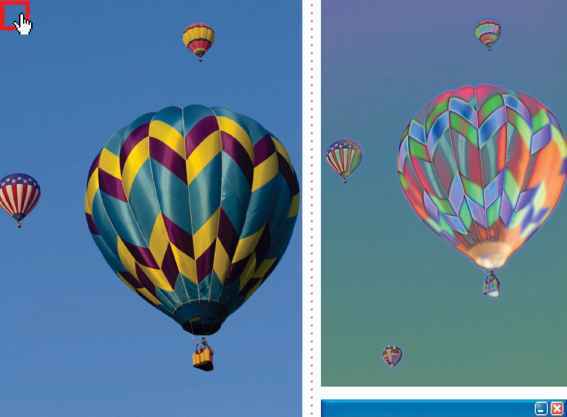 3 In the Layers palette, select and expand the Image Rollovers layer set. If necessary, click to set an eye icon (- ) for the layer set to make it visible. 4 In the Image Rollovers layer set, click to remove the eye icons (•) from the For Structures and For Art layers, as needed, so that the For Designs layer is the only visible layer in that layer set. 5 Using the slice select tool, select the Structures_button slice, and repeat steps 3 and 4, except this time make the For Structures layer visible and hide the For Designs and For Art layers. 6 Select the Art_button slice and repeat steps 3 and 4 again, but make the For Art layer the only visible layer in the Image Rollovers layer set. 7 In the toolbox, select the Toggle Slices Visibility button (^<) and the Preview Document button (), and move the pointer back and forth across the buttons to see the results. Then click those two toolbox buttons again to deactivate them. 8 In the Layers palette, click the small arrow to collapse the Image Rollovers layer set. Then choose File > Save.